Ian Hugh Wallace graduated from UBC with a Bachelor of Art History degree in 1966 and continued on to receive his Master of Art History degree in 1968. Before he completed his schooling, Wallace was already teaching at the university, a position he held for three years. He later taught Art History at the Vancouver School of Art (which was renamed the Emily Carr College of Art and Design in 1983), from 1972 to 1998. He taught courses on contemporary art that helped to shape Vancouver’s young artists at the time. Wallace currently lives and works as an artist in Vancouver, focusing primarily on painting and photography. 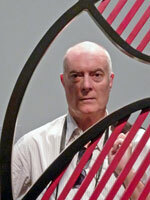 His work has been shown extensively in Canada and abroad. Wallace has said that his experience at UBC was enriched by a progressive learning environment, his fellow students, good facilities such as the library, informed and active teachers, and a contemporary cultural program of wide scope. This included programming such as the annual UBC Festival of Contemporary the Arts (1961-1971), which brought international figures in theatre, dance, music, literature and the visual arts to Vancouver. Wallace continues to attend events as well as presenting the occasional lecture or seminar at the university. Wallace advises students to be self-directed and active in class and university events, pay close attention to cultural activities in the city, use the library, learn to write and speak clearly, show interest in the professionalism of the instructors, initiate original projects with fellow students, use the resources of the university and the department as a platform for personal and collaborative educational and cultural programs.